Amblyopia, or “lazy eye”, is a developmental abnormality that could permanently threaten the sight of children. It is not always related to the appearance of a turned eye. Affecting between 2-3 % of children, it is the most common visual impairment in school-aged kids. Specifically, amblyopia is a developmental abnormality of the visual pathway in the presence of healthy eyes. In short, the eyes and brain are not working together properly. The term “lazy eyes” is therefore a misnomer as the condition does not arise within the eyes. First, what is normal vision? Normal vision is defined as being able to see 20/20 with one’s best-corrected glasses or contact lenses and having unrestricted peripheral (side) vision. In order to develop normal vision, certain neural connections are made between the eyes and the brain at a very early age. Each eye must individually send the brain clear images to process. If an eye fails to send clear images to the brain, in an attempt to prevent confusion, the brain will learn to ignore images from the blurry eye which may result in amblyopia without appropriate treatment. To fully understand amblyopia, we have to first examine the normal course of visual development. All newborn infants are born with poor visual acuity (the ability to see fine details) and varying degrees of a significant refractive error (a prescription for glasses). Visual acuity naturally improves over time and approaches normal adult vision by age three. During this developmental time, significant refractive errors are also minimized to almost zero. This process, however, depends on exposure to a rich visual environment that contains varying forms, shapes and fine detail, which most kids will normally receive. Amblyopia can be classified into three types: deprivation, strabismic, and refractive. Deprivation amblyopia results when factors block the transmission of clear vision such as a cataract, corneal scar, or droopy eyelid. Strabismus amblyopia develops when an eye is misaligned (eye that involuntarily turns in or out) which prevents that eye from seeing clearly. Refractive amblyopia is the result of having a high refractive error (i.e. a large prescription from myopia, hyperopia, or astigmatism) that is not corrected for. Deprivation and strabismic amblyopia have the potential to cause the most severe vision impairment and fortunately the signs are usually striking and are easily identified so that treatment is initiated early on. Refractive amblyopia is easily missed due to lack of obvious symptoms and no visible physical abnormalities unless there is also a strabismic component (the child’s eye would be misaligned). Children with certain conditions, such as Down’s syndrome, tend to have a significant refractive error. Other conditions such as autism or any speech impediment may also hinder a child from expressing difficulties with vision. Treatment options for amblyopia depend on the cause and are not always straightforward but they include surgery, patching the better “seeing eye” and/or glasses or contact lenses to correct for significant refractive error. Keep in mind that treatment for amblyopia is most successful when initiated early with results being most successful if initiated before the age of eight. Adults with amblyopia do not fair well even after aggressive treatment. Early detection will prevent permanently reduced vision. I must emphasize the mere presence of a significant refractive error (the need to wear glasses or contacts) DOES NOT indicate subnormal vision or amblyopia. 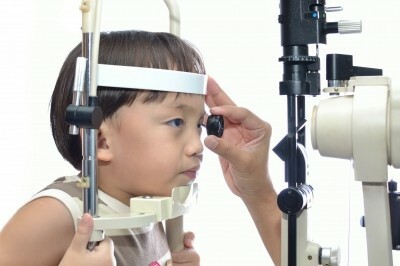 Every child should have a yearly comprehensive eye exam that evaluates their visual potential, refractive error and the ability of their eyes to work as a team by an Optometrist. Keep in mind that children, as well as adults, with poor vision in one eye may not complain because the deficiency may not be noticed with both eyes open. Take special note of kids who have developmental issues or those who have difficulties with verbal expression as they are the most likely to slip through the cracks. Amblyopia can be prevented and is treatable in young children when it is identified in a timely manner. This entry was posted in Eye Health and tagged amblyopia, childrens vision, lazy eye, turned eyes by laquintaeyedoc. Bookmark the permalink.